Vermont Fish & Wildlife Department As incidents of bears breaking into homes, garages, sheds and vehicles in Vermont increases, so too should efforts by residents to bear-proof their homes and secure potential outdoor food sources that can attract bears. While searching for food in early July, one bear broke into a Killington home through an open window, and another Killington bear entered the Northstar Lodge through an open door. 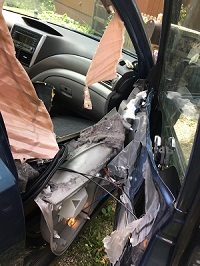 A Pownal woman awoke to the sound of a bear breaking through a kitchen window to access a honey comb that had been left within reach, while a similar incident occurred in Townsend where a bear broke into a kitchen freezer. The Vermont Fish & Wildlife Department is asking the public to report all bear conflicts to the department’s website atwww.vtfishandwildlife.com. Reporting an incident helps track problem areas and allows wardens or biologists to advise residents on ways to mitigate the problem. Residents are reminded that it is now illegal to feed bears in Vermont, even unintentionally.